Something that people ask about quite often is “are there some basic things that we can do to see if we can fix the air conditioner instead of calling out an expensive service technician?”. Service technicians often cost $200-300 or more just to come out and diagnose the problem, and that doesn’t even include the cost of the parts. Oftentimes before you get a service tech out, you can look at things yourself, diagnose it and see if there’s something simple that you can do. This can help you save a lot of money to say the least, so let’s just say that it’s the middle of the summer and that it’s quite hot in your house. Well, in that case there’s a checklist of things that you should be looking at. The first thing that you should go through is you’ll need to go over to the thermostat and check if the screen is blank in case you have a digital thermostat. If it is, then the batteries are most likely dead, so take the thermostat off the wall, change the batteries and see if that turns the screen on. If it doesn’t, that could indicate that you need to go down to the hardware store and buy a new cheap thermostat and put it back in if that’s something you are capable of. A word of warning at this point: sometimes a blank screen on a thermostat could indicate that the power is off to the entire system, but we’ll make sure to cover that later on. If the thermostat is calling for cooling and the batteries are good, it’s likely not the thermostat itself, but something else. If it’s not, I would go on to step two which is looking at your power sources. 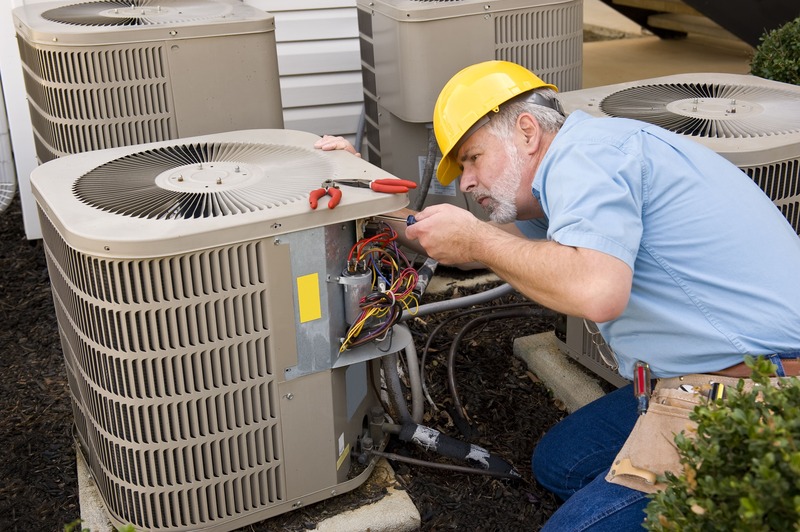 The air conditioner does not work in isolation: it needs the furnace or some type of blowing unit on the inside of the house to distribute the cold air and supply the low-voltage power going to the outside unit. Find out where the power switch is for your furnace and have a look at that. Make sure that the switch is turned on (sometimes switches are installed upside down so make sure that there’s power flowing through the switch). If there is power, I would also suggest looking at the breaker panel for the whole house. Make sure that the breaker is turned on before you do anything else from this point on. If your power sources are okay and your thermostat’s okay, I would suggest going on to step three which is looking if your filter is plugged in the system. 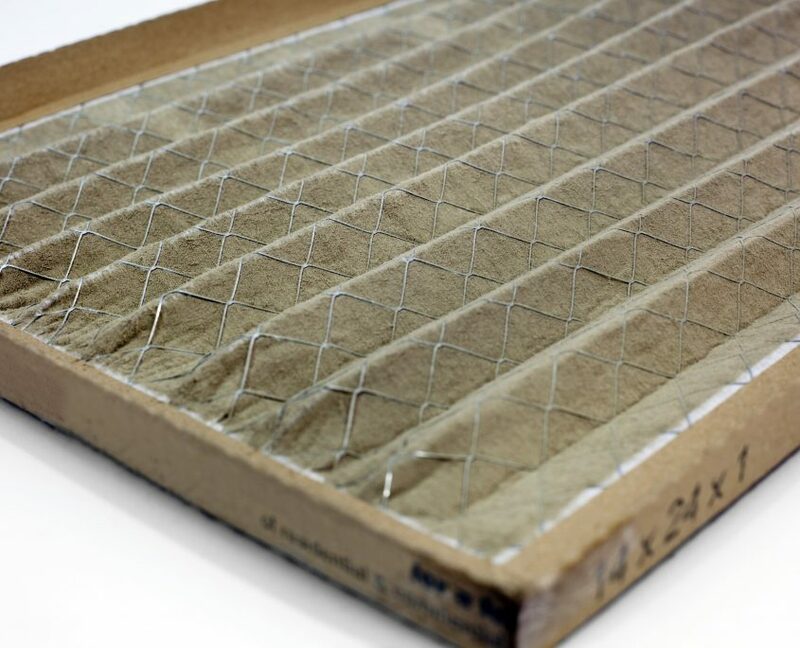 A plugged filter is probably the number one cause of air conditioner breakdowns and it can cause not only small problems but also complete failures of the system. So find where your furnace filter is, pull it out and see if it’s plugged. If it is, it’s quite likely that the system just completely froze up. At that point, I would suggest pulling the filter out, putting a new filter back to replace the bad one and leaving the system off for a couple of days. If you’re not careful your whole system can turn into a big block of ice because there isn’t enough air going through the furnace. After you wait a couple of days, you can turn it back on to see if it’s working or not. Although there’s no reason why that would get shut off, you could look at it and see if the disconnect has been pulled out for some reason on the outside of the house next to the air conditioner. With all those basics covered, that’s when we would start looking more in depth at more complicated problems. What you’ll want to do next is to start looking at the indicator light either on the outdoor air conditioner or on the furnace itself. For instance, you might see an indicator light that implies that there’s been a low-pressure or high-pressure lockout on the outdoor unit. You might have various other indicator lights telling you different stuff, you may be able to relay that information to the service tech before they come so that they’re more prepared to repair it when they do come. This will also save the service tech’s time, which will in return help you save money. Hopefully we are ablate save you a service call with the above tips!